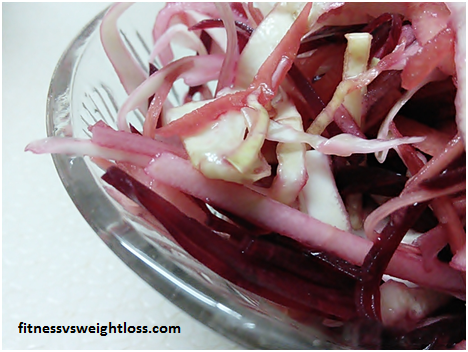 Home Health Sweet Beetroot Carrot Salad To Fight Cold & Cough This Winter! Sweet Beetroot Carrot Salad To Fight Cold & Cough This Winter! 1 tablespoon carrots thinly sliced. 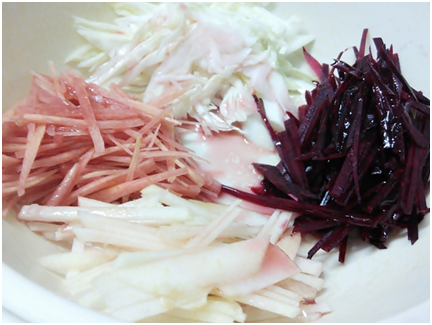 1 tablespoon cabbage thinly sliced. 1 tablespoon beetroot thinly sliced. 1 tablespoon apple thinly sliced. Take pomegranate juice in a bowl and add olive oil and vinegar. Pour the syrup all over your raw veggies/fruits and mix. Why should you eat this salad to fight cold and cough this winter? It has carrots that is rich in vitamin A, C, B-complex. It is also rich in poly-acetylene anti-oxidant, calcium, manganese, copper, phosphorus, potassium that helps fight infection, protects heart from diseases, prevents stroke, keeps skin, hair, teeth, gums in a great healthy state. And it also provides only 41 calories per 100gm. Beetroot is also a really great food that one should add to his/her food plate since it contains zinc, phosphorus, fiber, potassium, copper, manganese, vitamin B6 and much more that lowers blood pressure, detoxifies our blood, boosts immune system, fights cancer, keeps kidney liver, muscle, bones and pancreas in a healthy state! I am sure you have heard the message “An apple a day keeps the doctor away”. But do you know why? If not then let me tell you an apple can prevent stroke, lower blood pressure, protect heart, cleanse colon, strengthens bone, purify blood, maintain cholesterol and diabetes. Pomegranate also maintain blood pressure, blood glucose level, boost immunity, prevent cancer, reduce heart-burn, help in digestion, lowers acidity and much more! Well cabbage is something that I absolutely love and eat almost everyday! This amazing leafy vegetable is rich is almost ALL types of vitamins. 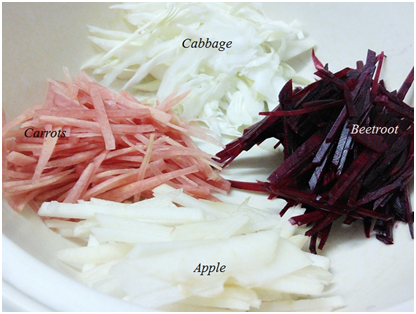 It’s rich in vitamin K, A, C, folate, niacin, riboflavin, calcium, manganese, copper, iron, phosphorus, sodium, potassium. It boost immune system, cleanse colon, aid in weight loss, prevent cancer, purifies blood, lowers blood cholesterol level, fight infection. It’s good for hair, skin, nails, bones and nerves! Will you try this yummy salad? Sweet Beetroot & Carrot Salad To Fight Cold & Cough This Winter! How Leptin Resistance Causes Obesity and Weight Gain? Eat protein for breakfast to lose weight! Find Out Why?